SUPER DEAL LED Desk Clamp is ideal for anyone who strains their eyes to see words on a page or for projects that require small pieces. It magnifies and provides light without glare. The 5 inch diameter lens with a 9 inch focal range brings renewed clarity to reading papers, doing cross stitch, knitting, crocheting, beadwork, sewing or other hobbies that require small pieces. This magnifier lamp also works well on electronic devices such as a Kindle, mobile phone, or iPad. ★ Newest magnifying lamp on the market: Beautiful oval glass lens, optical-quality 5-diopter magnification. It's perfect for anyone who needs a wide viewing range to see words on a page or small pieces of a work or hobby project. ★ Perfect for work or hobbies: It was designed for anyone with vision problems such as aging eyes or macular degeneration so that they can see their work or hobbies with ease and without glare. 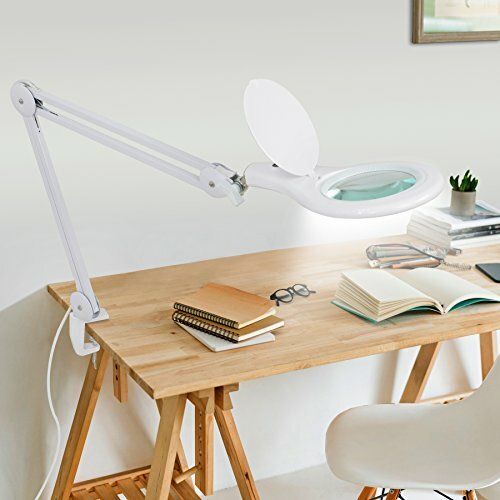 ★ Dimmable and adjustable: Heavy-duty clamp system holds firm to desk or tabletop up-to 2.5-inches thick without damaging furniture, allowing it to attach easily to a desk, drawing table, shelf, sewing table, or workbench. 32-inch triple-joint arm adjusts with feather touch and holds position without springs. ★ Long lasting & energy saving: 56 ultra-efficient, individual SMD (surface mount diode) LED bulbs produce eye-pleasing task lighting on less than 9-watts and about 680 lumens - last 100,000 hours and won't get hot! ★ Versatile and utility: Its large 5 diopter lens brings renewed clarity to reading, cross stitching, knitting, crocheting, beading, or other hobbies. This magnifier lamp also works well on electronic devices such as a kindle, mobile phone, or iPad.